Norma writes, "I edit a lot of movie clips of 2 to 4 minutes in length, & would like to know how to compact them down enough to send via e-mail. The clips run approx 50 to 100MB, but the e-mail seem to take only 4MB. I get e-mail with short videos from others that have been downloaded from YouTube or a commercial site & sent as attachment. Is there a program that does this?" I personally recommend against sending videos via email. Considering all the issues people have with infected messages and blocked content, it's far easier to send someone a link to either view online or download after they get to a site. The other complication is being forced to compromise both image quality and file size do to the limitations of whatever company provides your mail service. If sending via email is a matter of privacy, use a service like Eyejot, which lets you define who has access to each video you want to send. You create the video, use Eyejot to share the video, and their service notifies your friends or customers that they have a video to watch. You retain complete control over who gets to watch your video. After you signup for Eyejot, you have the option to either record videos with a Webcam or upload other videos to send to people. When sharing videos as an email attachment is your only option, there are a number of options for keeping the file size to a minimum. Use a smaller resolution than the full 640x480 or 720x480 your camera recorded. The maximum size you should use for sending a video through email is 320x240. For example, picking one of the Pocket PC options in Windows Movie Maker will get you under the 4MB limitation on most videos of 3 minutes or less. Limit the frame rate to further reduce the file size. I prefer seeing videos at 30 fps (29.97), which is considered full motion video because it looks more natural. You can dramatically reduce file size by cutting that in half with 15 fps videos instead of 30 fps. Use effects sparingly when creating your video. Special effects and transitions dramatically increase file size because they increase the complexity of the file. Target a specific file size in the video editing application during the export process. 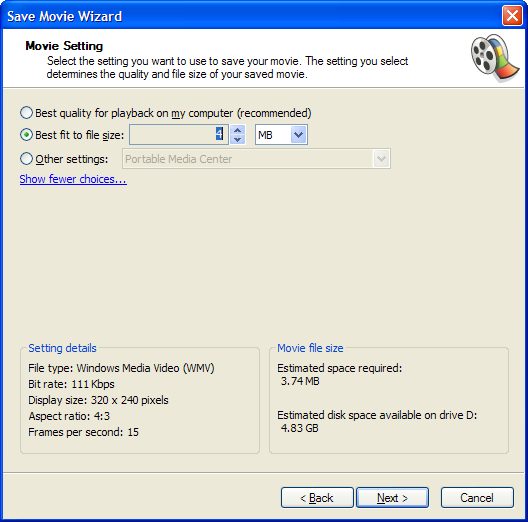 Windows Movie Maker offers a Best fit to file size option that lets you choose a file size. The software automatically picks the resolution and frame rate best suited for your selected file size. You won't get an outstanding looking video when doing this, but you will hit the required file size. Convert the file to a format optimized for low bitrates. You can often reduce the file size by using a video format like RMVB or DivX, both of which look great at low bitrates. Unless you know the person receiving the video can play it back, stick with more common formats like WMV, MOV or MP4 which are supported by the standard iTunes and Windows Media Player almost everyone has installed on their system.